Jack Harman has enriched the lives of us all for many decades, with sculpture which celebrates Canadians and Canadian institutions. He has created some of Vancouver’s best known sculpture including Themis, the Greek Goddess of Justice at the Vancouver Law Courts, the Family Statue in front of the Pacific Press Building, Harry Jerome in Stanley Park, and Bannister and Landy’s “Miracle Mile” at Empire Stadium. 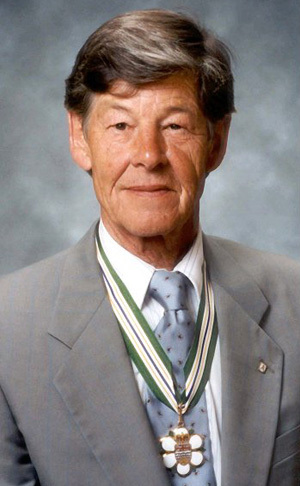 Beyond B.C.’s boundaries, his work includes the Queen Elizabeth II equestrian statue on Parliament Hill and the Peace Keeping Monument at the entrance to the National Gallery also in Ottawa. Vancouver born Jack Harman studied in Toronto and Europe. He returned to B.C. where he taught for 12 years at the Vancouver School of Art and the Emily Carr College of Art, and then established the first sculpture foundry in B.C. The Gastown foundry enabled him to provide studio space for up to 22 other artists thus helping them in their own careers. As well as casting his own work, Mr. Harman was the first to encourage northwest coast Native artists to begin casting their carvings in bronze. He put his sculpting career on hold to cast the work of other sculptors including O.B.C. recipients Bill Reid and Robert Davidson and many others. Our recipient now lives in the Sechelt Peninsula where he set up a foundry and continues to work as a sculptor and serve as a mentor to young artists.